When you save water, you lower your bill while also protecting our environment. Fortunately, there are many simple ways to save water every day. The first thing to do may be the easiest: visit the main Tacoma Public Utilities administrative building at 3628 S. 35th St. to get efficient showerheads, faucet aerators, shower timers and outdoor watering supplies — all for free. These products will help you begin saving water immediately. We can also do a free inspection of your house and yard to look for active and potential leaks, and offer suggestions for fixing them. Contact us at (253) 502-8723 or conservation@cityoftacoma.org to learn more. Below are practical tips and tools to help you use less water at your home or business and save money on your utility bills. The average American home wastes about 10,000 gallons of water per year, mostly due to small leaks. That is enough to fill a backyard swimming pool! Fortunately, it is easy to prevent most leaks once you know what to do. Learn more about finding and fixing leaks. High-efficiency toilets use as little as 1 gallon of water or less per flush compared with older models that use 3.5-5 gallons per flush. If you have an older toilet, replacing it with an efficient model would save up to 2,400 gallons of water per month and reduce your annual water bill by about $78. When shopping for a high-efficiency toilet, be sure to look for the WaterSense label. 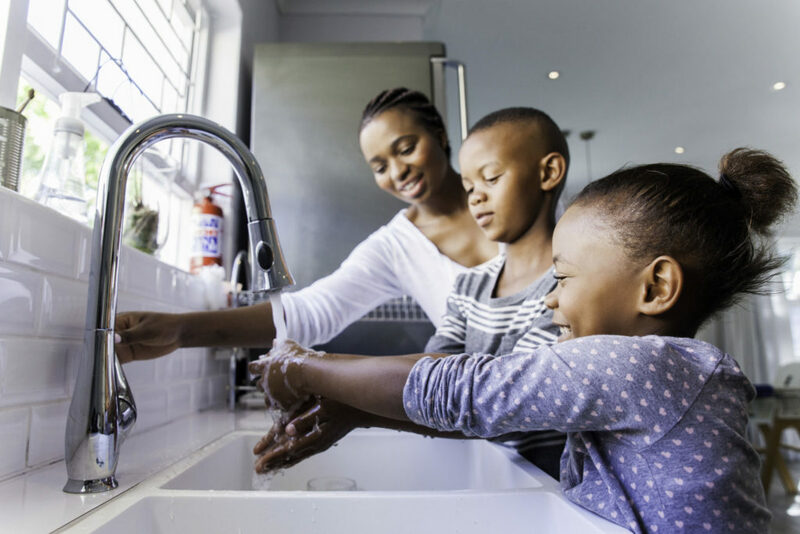 By installing efficient showerheads, a family of four could save 3,600 gallons of water and $60 in utility costs per year. New, efficient showerheads use 1.5 to 2 gallons of water per minute, while showerheads manufactured before 1994 use 2.75 to 8 gallons per minute. To get your free water-efficient showerhead, visit the main TPU administrative building at 3628 S. 35th St.
Faucet aerators screw on to the end of your faucet and mix air with the water flow to reduce water use. Efficient faucets with an aerator use just half a gallon per minute and costs you 80 cents per month, while standard faucets using 2.5 gallons per minute can cost you about four dollars per month. To get your free aerator, visit the main TPU administrative building at 3628 S. 35th St. Newer, more efficient dishwashers use as little as 3 gallons of water per cycle or less, compared with older models that can use up to 14. When doing dishes, make the most of each load by filling the dishwasher to capacity. If you wash dishes by hand, filling the sink and adding soap rather than running the water as you wash saves a significant amount of water. The average household washes 300 loads of laundry each year. Using a new, more efficient model that takes 10 gallons per load can reduce your water use by 75%. During the summer, water demand in our area increases by about 60%, mostly due to outdoor water use. Unfortunately, about half of this water is wasted due to overwatering. To help reduce water waste, and lower your water bill, you only need to water one inch per week or you may want to install an efficient sprinkler system. This tool helps you calculate approximately how much water you use each day. It also shows you which water uses in your home are efficient and which are not and offers simple conservation tips. Use this online calculator from the American Water Works Association to estimate your water waste and see how much you could be saving. This detailed guide from Tacoma Water includes water use facts, conservation tips, resources and information on water-efficient appliances and products.